The title is totally cheesy, I know. After putting together today’s outfit, I needed a pretty sim to photograph in, so I visited Yse Ah’s blog. Her blog is an amazing resource to find nice locations for photos, and I use it all the time. When I saw her post about the Amia sim, I had to check it out. Just a couple of days ago, I saw someone blog a rainy picture that looked amazing. The rain effect was done with Photoshop, but since I can’t really do all of that (lack of PS skills), I decided to use the NODe umbrella, which is scripted with a stunning rain effect. YAY! 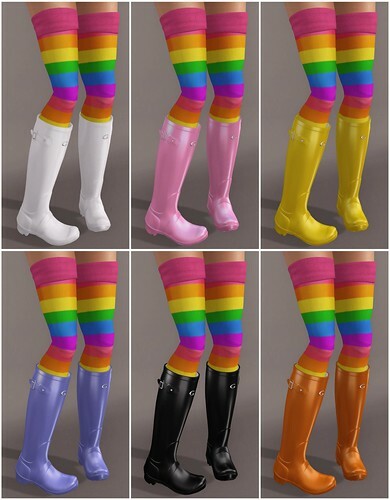 Have you seen these lovely new Gos (Mesh) Wellingtons? I had originally wanted to re-create a Rainbow Bright costume using SL items, but I couldn’t think of a nice Rainbow dress, but I customized the shoes & wore some Rainbow socks anyway! These (Sheer) Frank Rainbow Amortentia tights from Schadenfreude are amazing but they lacked nice sculpted cuffs, so I borrowed some from my Maitreya Moxie Over-Knees Socks, and tinted it the same color. 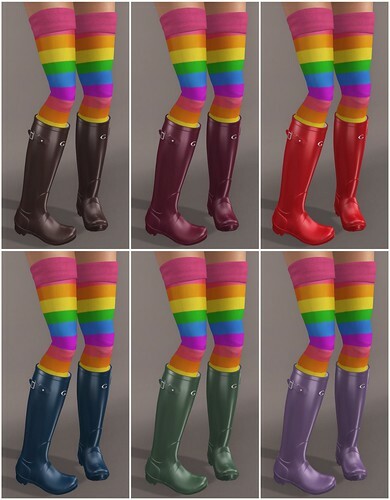 The Gos Wellingtons are available in 12 colors, but scripted to change Strap, Lip, Sole, and Boot color so you can create many different combinations. Haha, this is what I love with SL and totally miss in RL — you can take a little piece from that product and add it onto another product 🙂 AND tint them! Lovely shots and lovely sim..
O.o I love Umbrellas!!!!!!!!!!! This is a fantastic blog! Thanks for the word on the NODe Umbrella! That’s so cute I’ll be smiling all day. These boots look a little too much like huntingtons wellies in rl for my comfort. There’s definitely got to be some sort of copyright issue. I have to get some of those boots now! They are so awesome AND they have my initial on them lol.